w i n t e r 2 0 1 4 | w e s t w o r l d A l b e r t A 29 skip to the front of the line. (Disneyland still offers paper versions in addition to the digital bookings.) Try Rider Switch. It's a common problem for families with an odd number of members – someone always gets left out. So Disney designed something called Rider Switch. When you take advantage of this (free) option, one parent can ride with a child, then the other can switch and ride with the child again, with little to no wait time. Scout out fireworks-viewing spots early in the day. Each park, except Animal Kingdom, has a grand spec- tacle almost every night. And, not surprisingly, these draw thousands. Disney employees are usually happy to give advice, along with directions to places like Pecos Bill's Café in the Magic Kingdom, where you can have a rest and a snack – and secure the best seat in the house for the Main Street Electrical Parade. Beat the heat Seek the mist. When the mercury rises, grab your bathing suits and seek out misting stations – each park has several. 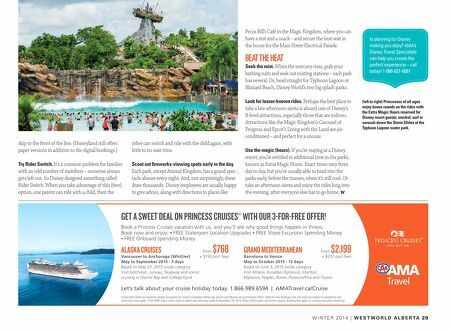 Or, head straight for Typhoon Lagoon or Blizzard Beach, Disney World's two big splash parks. Look for lesser-known rides. Perhaps the best place to take a late-afternoon siesta is aboard one of Disney's B-level attractions, especially those that are indoors. Attractions like the Magic Kingdom's Carousel of Progress and Epcot's Living with the Land are air- conditioned – and perfect for a snooze. Use the magic (hours). If you're staying at a Disney resort, you're entitled to additional time in the parks, known as Extra Magic Hours. Exact times vary from day to day, but you're usually able to head into the parks early, before the masses, when it's still cool. Or take an afternoon siesta and enjoy the rides long into the evening, after everyone else has to go home. W Is planning for Disney making you dizzy? 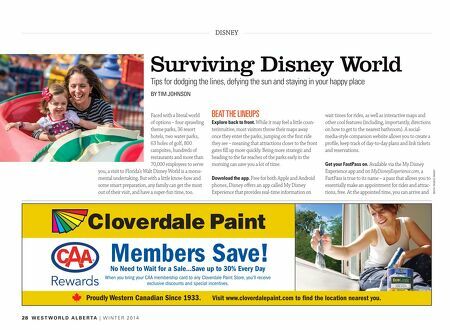 AMA's Disney Travel Specialists can help you create the perfect experience – call today! 1-866-621-6081 (left to right) Princesses of all ages enjoy bonus rounds on the rides with the Extra Magic Hours reserved for Disney resort guests; snorkel, surf or swoosh down the Storm Slides at the Typhoon Lagoon water park.